It is Sunday night, and I thought I would take this quiet time to reply to your post from this week. I do not have a hot beverage at hand -- just a bottle of bubbly water, fizzing quietly at my side. The week promises to be rather busy as I leave for the quilt festival in Houston on Wednesday and don't return until Monday. The next two days are for laundry and packing and general preparations so I don't leave the household in a mess. I have actually sewn a lot this week, working on a gift project that I can't show. But it was another good example of how having an externally-imposed need to create something, along with a specific deadline, prodded me into doing something I wouldn't have otherwise done. And, I might add, I am quite pleased with the result. So that has been rather productive and enjoyable and I have the very nice sense of anticipation of having made a gift I hope the recipient will like as much as I do. 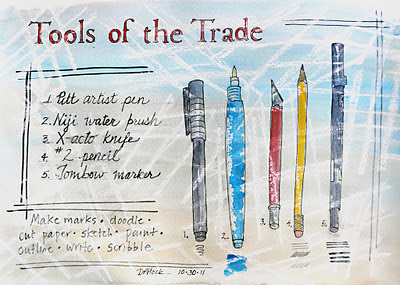 The sketching and watercolor on mixed media class continues -- we are in week 4. Last week, we were instructed to do various backgrounds for pages trying different methods. I found it very unsatisfying, just randomly creating backgrounds without any plan or reason to do them. This week, we are to put content on the pages, which is in part (I guess) about suiting subject to an existing texture/color/pattern, and also about learning what happens when you draw and paint on gesso, or absorbent ground, or collaged papers. (Or, to be honest, maybe it's not designed for any purpose other than this is another thing this teacher does and she's having us give it a try too.) I have come to the conclusion that I like my watercolors in pure form -- straight onto paper, and the mixed media aspect isn't doing too much for me yet. 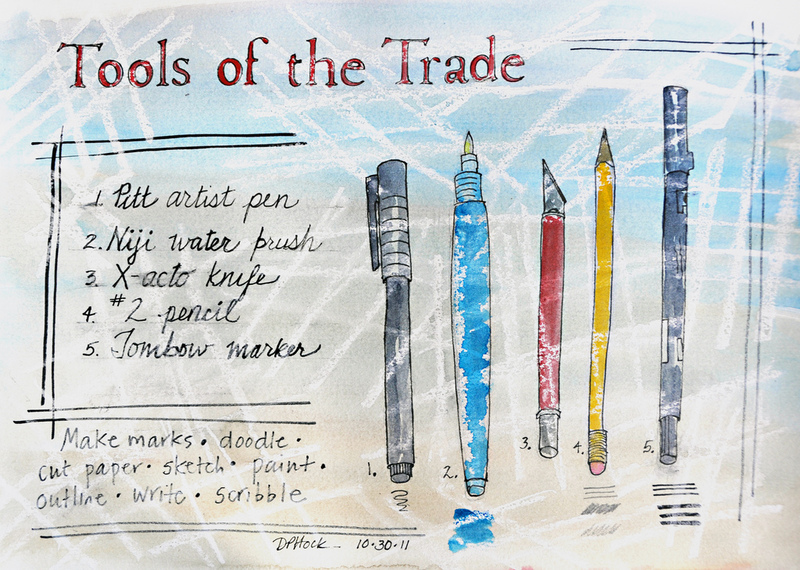 What I've put above was a very fast page I did earlier today, loosely sketching the tools on my worktable. You can see I'm not going for precision! My goal for this experience is to just enjoy the process, develop the habit of doing a bit of sketching and painting every day, and loosening up so the drawings have some personality. So far the wonkiness I achieve has less to do with personality and more to do with lack of skills -- but maybe they will overlap?! But that leads back to your comments about teachers and classes. You were differentiating between teachers and classes that teach you how to do a specific thing: replicate a quilt, make a book like so-and-so's... and I agree, I have no interest in that in terms of "I want to make THAT EXACT THING TOO." But you know? A lot of people like that sort of class. They don't want to think, they don't want to design, they want to make THAT. Just like that. My sister in her needlework business encounters that all of the time. She doesn't sell "kits" per se with patterns and colors all put together -- she sells patterns separately so people can choose their own colors. I've worked in her booth scads of times and most people just want to make the thing JUST LIKE the picture, without choosing their own colors are doing anything individual along the way. So clearly, there's a market. Those are the people who buy Magie's kits, yes? And it's wonderful that there are designers like you and my sister who can make work people want to replicate. But there are a lot of people out there like us, I think, who want something very different. And then there are technique classes -- and while many of them focus on a specific project, I can see that it makes sense to learn a new technique in the context of a project that is going to expose you to the technique's different issues. I think a good teacher can choose a project (or a variety of them for students to choose from) that will present appropriate experiences for the student to master the technique. If one is interested in learning a new technique, I think that sort of class can be very useful. I totally agree that the best sort of class is one in which you are encouraged or get the opportunity to take what the teacher is teaching and then apply it in a personal way. I think the best teachers are ones who can teach what they know, but who welcome and inspire the ability for a student to use that knowledge in the student's personal, individual way. But I have come to the conclusion that THAT is a very specific teaching gift, and many teachers don't have that. Sue Benner and Patti Hawkins are two art quilt teachers who, to my experience, demonstrate the BEST of that sort of teaching -- they know they are providing tools and a way of thinking about how to use the tools, and they have the talent for helping each student move in her own direction with those tools. It's actually my observation that in the quilt/fiber art world, there are a lot of teachers who don't teach so much as demonstrate something they've made, and then students repeat it in their presence. They don't teach the ideas behind what they're doing, necessarily, or the art principles that underly the process... they just say "I do THIS, and then I do THAT, and I use these materials" and students are then expected to scurry off and do that, too. I'm not saying there's anything wrong with that, but I'm not sure it's teaching so much as demonstrating what they do, if you know what I mean. I find that frustrating when I want to know more. And, given that you and I are alike in this way, you know that I generally do what to know more. I want to know why THAT, and why not the other. I guess it's that left brain kicking in. Yes, I did see the discussion on the SAQA list about art school vs self-learning. Interesting but again struck me as another issue which some people take way too seriously. It did not seem to me accidental that the most vociferous ones were arguing for the very education they themselves had gotten -- again, not so much an endorsement of their specific education as a demonstration of how invested they were in their own course of action. Which is not a bad thing! I also thought that so much of the discussion had to do with how much self-confidence people had, too. At any rate, I may be biased on this myself as I've had no formal art training either. I'm not in a position to really compare whether having been art school-taught or self-taught is better. BUT my continuing education as a home-schooling mom of a kid with quirky learning styles has made me study and think about the education process a lot, and here are some of my conclusions. People learn things differently. Dramatically differently. Some people need to hear them, some need to see them, some need to experience them. Some people don't have the discipline or motivation to propel their own education in a subject, while others chafe at externally imposed strictures and want to follow their own paths. So I can see that for some people, the structure and external validation of an accredited art school may seem like the only way, or the best way, to go. But really, I suspect that the important factors in getting an education in art have more to do with getting a good breadth of knowledge, good technical skills, doing a lot of practice, getting feedback from some independent source, and having a strong motivation to keep going. Probably being part of a community of others doing and discussing the same things is important too. But whether that happens through self-direction or a structured school program, I'm not sure it matters. I never did remember to say that I quite liked your journal sketches, by the way. I guess what's important is whether you enjoyed doing them and whether it felt like a useful/fun way to record aspects of your trip. Are you still working on Drawing on the Right Side of the Brain? I won't post here until after I've returned from Houston. You know you will be on my mind frequently (and I will try to keep my phone charged and handy for frequent pictures to you). I'll be interested to see whether it is as creatively inspirational as FoQ was. I am looking forward to seeing the Twelves, of course, and experiencing people seeing our quilts which is a huge boost on a lot of levels ... but I am most looking forward to the special exhibits like SAQA and Dinner at Eight artists and the like. I wonder what creative thoughts all of that will yield? I know you are very busy getting your studio together. Do you think having a studio will change your creative process? Will it affect your ideas, do you think? How do you think it will change the way you work?